Here at Animal Place, we know other animals experience emotions and bonds with one another. But Mr. G's bond with Jellybean the burro shows the incredible depth and importance of friendship. Mr. G and Jellybean were rescued from a hoarder in Los Angeles, California. We offered to take in Mr. G at our Rescue Ranch adoption center in Vacaville, California because we could easily place a goat into a loving, permanent home. Another sanctuary offered to take in Jellybean because they had been looking to rescue a burro. Had we known the depth of Mr. G's bond with Jellybean, we never would have separated the two. After his arrival, Mr. G refused to eat or move from his stall. Health problems were ruled out and myriad treats and foods tried...it soon became evident that Mr. G was in mourning, grieving for a friend he thought had disappeared. Immediately we reunited the two, a volunteer driving down to Los Angeles and bringing Jellybean back to Animal Place's Rescue Ranch adoption center. The video above shows their reunion. 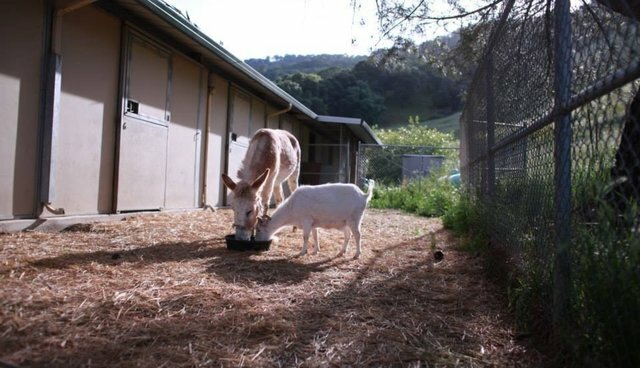 Now it's time for Jellybean and Mr. G to come home...they will become permanent ambassadors at Animal Place's 600-acre sanctuary in Grass Valley, California, their story living on for years to come and showing without a doubt that nonhumans can experience complex emotions, like grief.